Our neighbouring parish is laced around a rather confusing network of roads where I invariably seem to get lost. But if the village lacks a centre, the villagers themselves certainly don’t lack heart or organisational ability. Last weekend they put on their fifth and, in my opinion, finest sculpture trail. The idea originated more than a decade ago with a more modest project to showcase some of the beautiful gardens in Bergh Apton. The event worked brilliantly and in subsequent years they added a cultural dimension. Now it is one of the biggest sculpture exhibitions in Norfolk and surely one of the most important arts events in any British village. This year they weren’t blessed with the weather. When the vehicle behind us became mired en route to the car park and its hopelessly spinning tyres set up a thick spray of Norfolk mud, it seemed a perfect metaphor for the wider sense of frustration. Fortunately, on the last of three weekends the sun shone, 1,000 cars filled the field and the roads were thronged with cyclists and walkers. People at the entrances to the dozen gardens often asked you which was your favourite piece, suggesting a hint of friendly rivalry between the burghers of Apton. I must confess, despite the glorious range and quality of the work, I almost plumped for a non-sculptural feature. No, not the string quartet, nor the brass band, nor the vast throng besieging the ice-cream trailer. 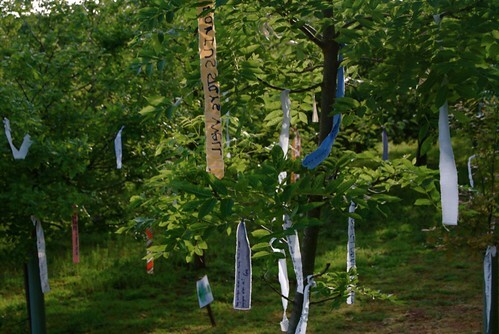 The Wishing Trees were an inspired bit of old English animism: we were invited to express our heart’s desire on lengths of calico attached to the spreading limbs of summer greenery. (One touching piece read: “I wish my grandad would come back to live [sic].”) At Bergh Apton last Sunday it certainly felt as if some dreams had come true. 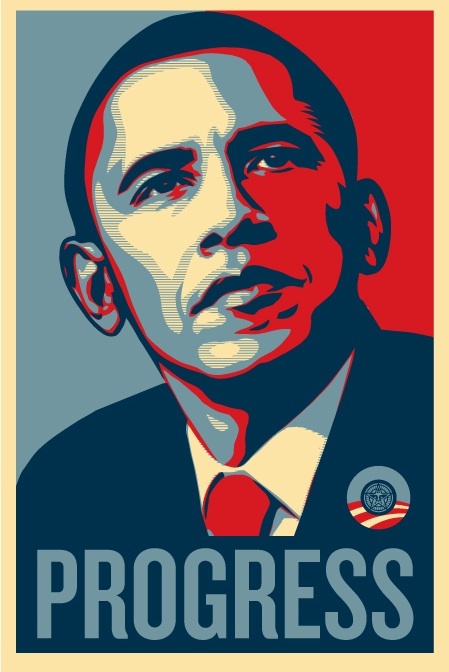 Poster from the Obey website. Obama is a young man, and no matter what his political future, he too will disappoint the same people he instigated. It’s inevitable. Nevertheless, the millions he’s already touched will never forget this moment in history because, no matter your political stripe, there’s no denying that our nation has been sleepwalking for the past eight years. We put the covers over our heads on September 12, 2001, got up to look around in 2004, and then hit the snooze button again, hoping that things would work themselves out. They didn’t. And they won’t. Obama has jolted us awake. The air is crackling again with the power of possibility, with the belief that there’s still some magic to be squeezed out of the American Dream. And that sensation is as real as it is unforgettable.